Bake a 12-inch square cake or a sheet cake the size that you need. With an icing filled bag and round tip, size #5, draw Bambi on the cake top. Refer to the picture for the outline. 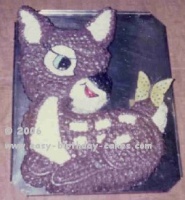 Cut the cake away around the Bambi outline. With white icing and star tip, size #18, cover the inside parts of the ears, area around the eye, muzzle area, chest, spots and under side of the tail. Next, do the eye using star tip, size #18 and blue and black icing. Do the nose in black icing and the same size star tip. Use the same black icing and round tip, size #5 and do the eyelash and outline the smile. Make a small amount of red icing and use round tip, size #5 and squeeze red icing inside the outline of the smile. Next, make a yellow icing and use star tip, size #18 to cover the butterfly on Bambi’s tail. Make a small amount of sky blue icing and use round tip, size #5 to make the small dots on the butterfly. Also, outline the butterfly’s wings. Make the line down the center of the wings a little thicker. Now make a light brown icing and cover the rest of Bambi.